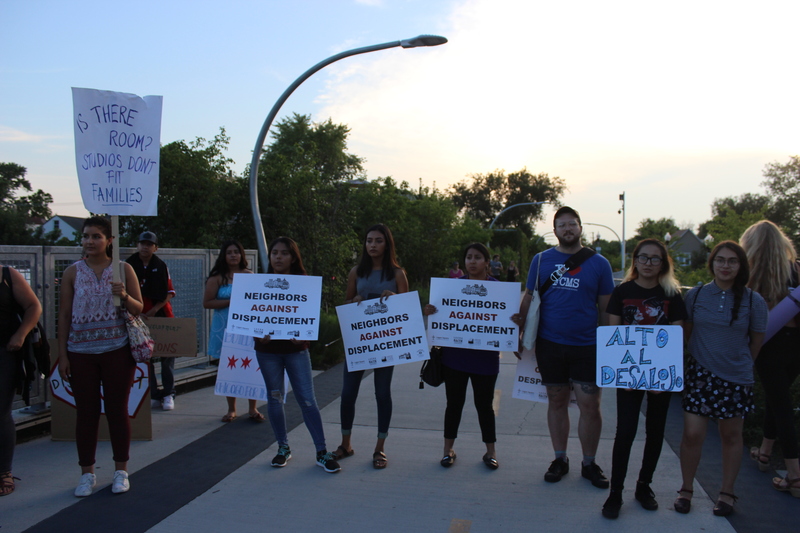 LOGAN SQUARE — A group of youth leaders who helped shape the 606 affordable housing ordinance and their supporters marched to the elevated trail Wednesday evening and then formed a wall to block joggers and cyclists from passing — all in an effort to keep momentum for the legislation going. The ordinance, designed to curb gentrification along the 606, hasn't seen much movement since it was introduced before the City Council in May. 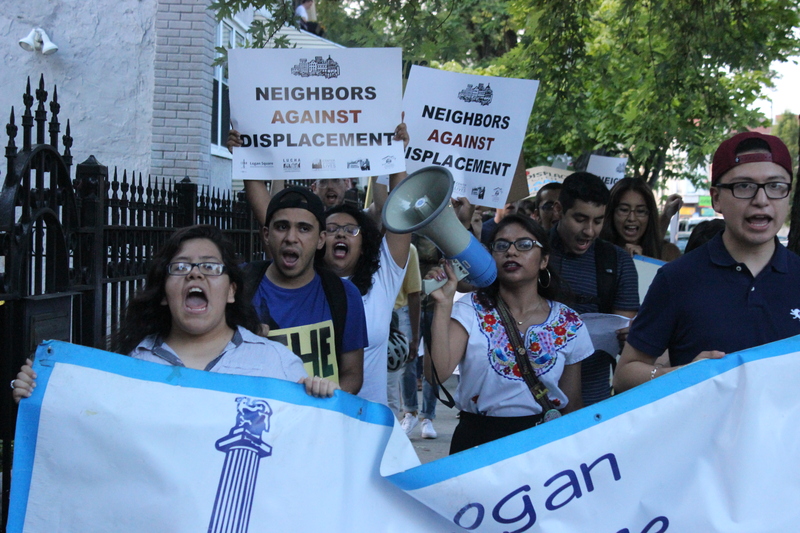 Logan Square Neighborhood Association, one of the neighborhood groups that helped write the ordinance, organized the march to "keep people thinking and talking" about the proposed legislation, according to Christian Diaz, housing organizer for the association. Diaz said the ordinance is expected to go before the city's zoning committee after it's been thoroughly reviewed, possibly in September. 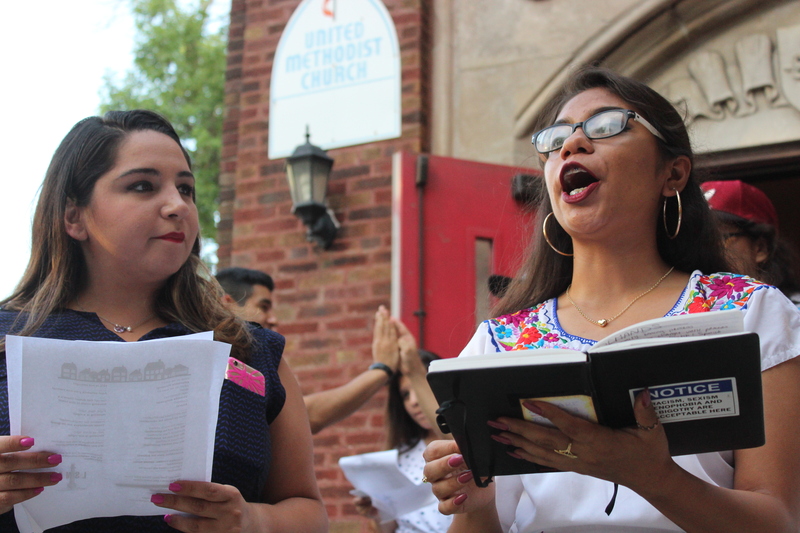 The march started on the steps of Humboldt Park Methodist Church, 2120 N. Mozart St., where youth leaders like Ashley Galvan Ramos, 18, gave impassioned speeches about how Logan Square "doesn't feel like home anymore" now that gentrification has taken hold. "Logan Square has always been my home. I went to grade school in Logan Square and all my memories are in Logan Square. I've seen Latinx people leave, and luxury developments pop up, and I've started to feel unwelcome in my community," Galvan Ramos said. A member of the church, Delia Ramirez, 34, said her parents each worked multiple jobs for years to be able to afford their home at Central Park and Wabansia avenues about 27 years ago. After finally paying off their mortgage, Ramirez's parents are now faced with new challenges: The rising cost of property taxes, utilities and maintaining the affordable units they rent out. "They're barely making it," Ramirez told the crowd. "I look to the right, and I am reminded that they are constantly trying to push us out of the place that we have called home for a very, very long time," she added, pointing to three luxury buildings adjacent to the church. "My fear is waking up to a building like that with neighbors who never want to engage us." The group heads down California Avenue. The money would then be deposited into an affordable housing trust managed by a board made up of local aldermen, leaders from local groups including the neighborhood association and Latin United Community Housing Association, and commissioners of the city's Buildings and Planning and Development departments. The law would apply to what co-sponsor Ald. Joe Moreno (1st) called "a pilot area" — a large portion of Logan Square and Humboldt Park bounded by Hirsch Street on the south, Palmer Street on the north, Western Avenue on the east and Kostner Avenue on the west. After remarks at the church, the group marched down California Avenue with signs that read, "Now that the neighborhood is nice, why do I have to move?" and chanting, "Hey hey, ho ho, demolitions have got to go." The group on the trail, where they formed a wall and blocked joggers and cyclists from passing. Once the group reached the trail, they formed a wall, blocking joggers and cyclists from passing through as they continued to chant. Most of the trail users who encountered the protest turned around without exchanging words with the group.